I installed Prepar3d no problem. I installed active sky....Had it all up and working. Had issues with add on airports and A2A FSX planes. Didn't work right and could not find bad files to remove back out. I don't think is was compatible with 4. Did an uninstall of Prepar3d to start over. Pulled Prepar3d from my "downloads" directory. Reinstalled and Worked fine... Had another issue that caused me to uninstall again and reinstall. But this time it installed without any airports or planes. Only a few in Alaska and the f22. Zero vehicles loaded. That's it... Weird. I uninstalled a third time. And downloaded from you site to get that version... Same problem. Then i ran "client...content...and scenery" installs....and tried to repair. Then ran repair at "Setup_Prepar3d.exe". Still no planes...or airports ?? Can you help me?? Remove the Prepar3D generated files and let Prepar3D generate these again when launched next. Note: This process will disable your 3rd party Add On's and reset all previously saved settings back to default again. 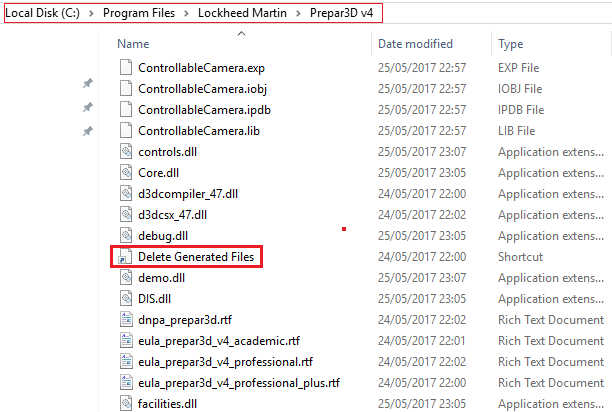 Navigate to your core Prepar3D v4 folder, Scroll down a bit, Double left Click on the file Delete generated files, A small black window will appear and then disappear again, this is normal. That did it.... Dilly Dilly my friends!! !